Thank you for building this congregation and serving these people that I’ve now been called to serve. Please know that I would like to invite you back as a guest sometime during my ministry here. If you are in town visiting, please let me know so we can get together. If you are asked by your former parishioners to officiate at their weddings, family funerals, etc. please say a simple ‘no.’ If you say ‘yes’ you are making it hard for me to establish myself as their pastor. If you say ‘I’d love to, but I have to be invited by your current pastor’ you are putting me in a difficult position because if I then don’t invite you, I am the mean new pastor. Thank you for understanding. As I’ve written many times in this blog, the relationship between current and former pastors can be tricky for countless reasons. What if the former pastor considers himself beloved, but now that he’s gone, the congregation resents him and blames him for various problems (and they don’t want to see him again)? What if the former pastor is actually beloved and has retired down the street? What if the former pastor’s family grew up in that congregation and they stayed with their own children after their mother accepted a call far away? So many factors make the relationship between current and former pastors delicate. In a perfect world, former and current pastors love their congregations more than their own need to be beloved (and so former pastors don’t interfere.) In a perfect world, former and current pastors are mature, secure in themselves, and have lots of friends who are not part of their former or current congregations. Last weekend, I was invited to visit my former church for the first time by their current pastor to be a guest in worship. I had not been back for almost three years. The pastor invited me forward to share updates on my family. (Our three kids had grown up among them and were now 20-somethings.) I let them know what HH and I were doing in ministry. It was not only lovely and generous. “It completed the circle” in the words of my wise sister in ministry. After leaving my first church, where I’d served for five years straight out of seminary, I moved several states away and – apart from Christmas cards – I was never seen again. I literally never again saw or talked with people whose spouses I’d buried or whose babies I’d baptized. I was invited back once for an event but it was between pastors for them and an elder invited me. Sadly, I couldn’t attend because of a prior commitment, but it would have been healing to return and see that they were okay and I was okay. What if current and former pastors saw ourselves as partners – both loving and serving the same people but in different times? What if current and former pastors intentionally made that circular connection for the sake of people who have cared for and been cared for by both of them/all of them? What if we current and former pastors first considered, “What would be best for this church?” in terms of relationships? What if it never had to be about our own stuff (insecurity, jealousy, loneliness, the need to hang onto a role)? What if all pastors were as generous and wise as JW-B? 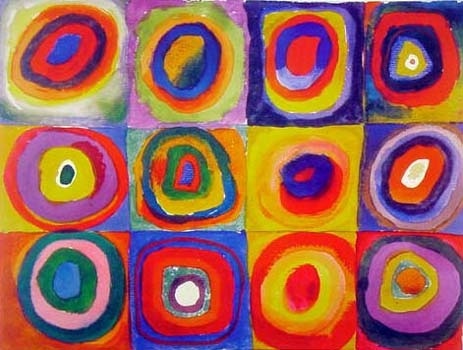 Image is Circles by Kandinsky. I would have loved to have been able to graciously welcome my predecessor back for occasional church events, but his spontaneous, unannounced appearance at each and every one of them prevented that. I’m okay, I guess, with the pastor who followed me not inviting me back. He did suggest once our getting together for coffee, but four years later, he still hasn’t followed up. I feel strongly that it is his move to make, not mine. What if all pastors were as generous and wise as your friend, indeed.